The interdisciplinary intensive seminar offers a university course and a forum for students and young researchers. Noted lecturers and professors from different Central European universities are going to help to discuss legal, political, social, economic and EU-aspects concerning the costs of democracy in Europe and in our region. The seminar will include lectures on thematic issues, workshop opportunities with the active contribution of participants and cultural events as well. Venue – official programme: Széchenyi István University, Faculty of Law and Political Sciences, Building “J”, H-9026 Győr, Áldozat str. 12. (Hungary). Period: 22-26 February 2016 (from Monday to Friday). The Seminar is open for graduate students and PhD candidates as young researchers from the fields of legal, economic, social or international studies from all over Europe. 30 places are provided for incoming students from abroad. We present certificates on the participation and contributions. You can obtain 5 ECTS credit points. cultural programme – including visit to the archabbey of Pannonhalma, visiting a wine cellar and a rich dinner of Hungarian cuisine. 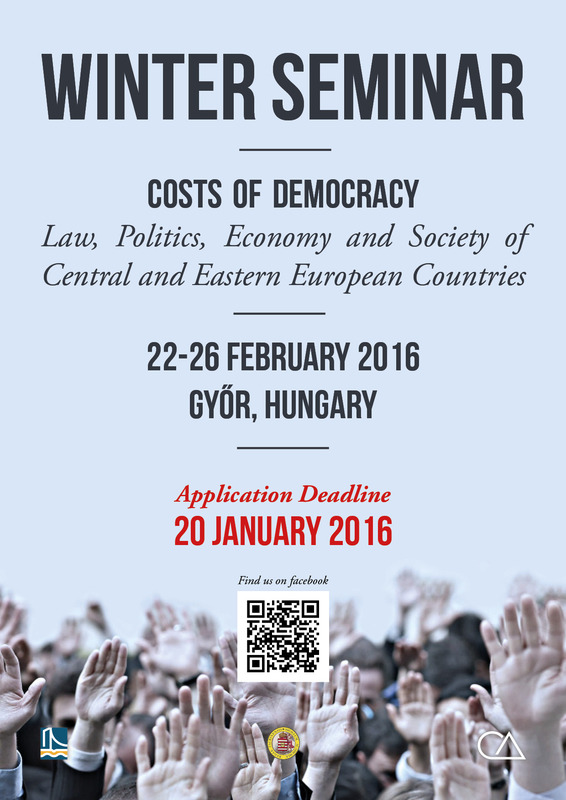 How to apply to the Winter Seminar 2016? The applicants will be informed about the results until 5 February 2016.